First impressions of the Solway Dory Expedition Bermudan Rig. Thread: First impressions of the Solway Dory Expedition Bermudan Rig. Well the cat's out of the bag, I've managed to get my hands on one of the first Expedition Bermudan rigs from Solway Dory. As soon as I heard about this new rig I was intrigued and was keen to see how it performed in comparison with my 35sq ft Expedition Lugsail. Today I had the opportunity to try the new rig for the first time when I drove over to Duck Bay on Loch Lomond. The forecast was for winds between 10 and 15mph but in actual fact it was blowing a bit more than that and was fairly gusty with it. The first thing to do was assemble the new rig but before I did that I took a couple of pictures of my old rig and new rig alongside one another to compare the packed size of them. The Bermudan is at the bottom and the Lugsail at the top. Here they are side by side, Lugsail on the right. As you can see there's very little difference between them, the Bermudan is slightly bigger but it's not really significant. 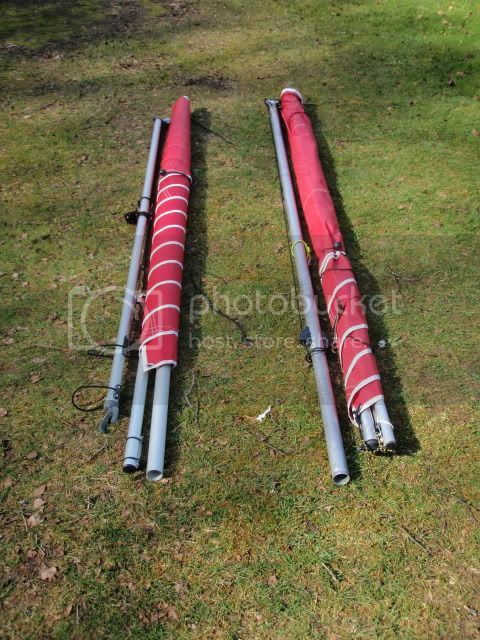 The next thing was to rig the Bermudan so I laid the sail out and assembled the two piece mast (which was simple). Once the mast was assembled it was easy to slide it up the sleeved luff tube then tie off the tie at the mast head (this locks the sail to the mast to allow it to rotate as one and makes the sail so easy to reef). After that it was simply a matter of adding a little downhaul tension to hold it all together and carrying the mast and sail assembly down to the beach and sliding it through the mast thwart on the canoe. While fitting the boom I immediately noticed that there's a bit more headroom than with the Lugsail which is good news when tacking and would be handy if carrying a passenger. 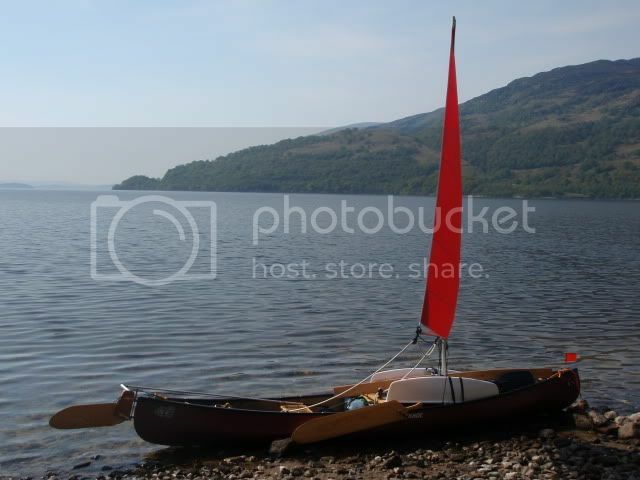 Here's the canoe assembled on the beach with the sail furled. It was really easy to unroll the sail while adding the right amount of outhaul and I was ready to sail. I set off with the full sail area out and sailed about a bit to get a feel for things. The rig felt more powerful than the Lugsail and had a bit more heeling effect (I imagine this is due to the taller mast and higher centre of gravity). The most noticeable thing was how much higher it will point, my seat of the pants estimate based on watching my burgee was that the Bermudan will point around 5 degrees higher than the Lugsail. There were no nasty surprises and everything worked really well. After a little while I came ashore to try reefing the sail and attaching the kicker (which is a 2-1 pulley set up rather than the basic one on the Lugsail) the other way up. The gusts coming through were pretty strong and once away from the shelter of the shore there was a fair old swell running so it was also a good chance to bail out all the water that had come in. I went back out with a couple of reefs and set off beating northwards to sail up between Inchmurrin island and the Carrick golf course. As I got further out of the lee of the land I was glad I'd reefed, there were plenty of white horses and even with the reef I had the outriggers buried a few times and spent plenty of time sitting up on the gunwale. It was fantastic sailing and the sunshine only added to the experience. As ever the camera doesn't do justice to the conditions but you can make out the odd white horse in this picture. Once north of Inchmurrin I stopped to stretch my legs and as the wind was building even more and I was on my own I decided to head back towards the van just in case. The run back downwind was fun with the waves providing a nice push as I surfed down them. A bit of video of the downwind action. Once I was back I sailed about near the car park for a while trying the full sail out again (which was great fun). I did notice that the extra leverage of the longer mast was causing my canoe to flex even more than with the Lugsail and I may have to look into getting a braced sailing thwart to help reduce this. I didn't try paddle sailing as it was challenging enough using the rudder to steer today but I imagine that the ease of reefing will make the rig very forgiving as a basic tripping set up. I have to say the Bermudan does seem to allow you to have your cake and eat it, it makes a fantastic sailing rig in it's own right giving better performance than the Lugsail and having the ability to reef almost infinitely means that it would be manageable for a total beginner. At a later date it could be combined with a small 14 sq ft mizzen and you'd have all the power you'd need. I really think this rig could be all things to all people for using in an open canoe. I can't wait to get back out and do some more testing. Looks the biz. What is the difference in mast height between the Bermuda and the lugsail? The two pieces of the Bermudan mast are roughly the same length as the one for the Lugsail so it's almost twice as tall (not quite though as there's an overlap between the two pieces of the Bermudan mast). It sails like a dream, I'm really impressed with it. I will have to brace the thwart though as the canoe was flexing a lot more than with the Lugsail (and it was bad enough with that). That's the downside of having a relatively lightweight canoe I suppose. Great stuff, Chris! Looks good. Looks good Chris. Don't you just love nice crisp sails without any folds or creases in them! Like walking on fresh snow. 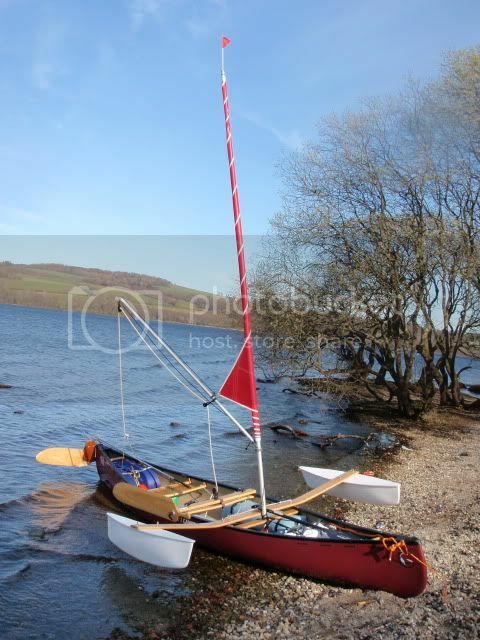 Slight shame about the canoe flexing, though I expect this is inevitable given the height of the mast. When I eventually trade up to a 44 sq/ft or 50 sq/ft Bermudan, it will probably be even worse. I can see a "Mast Thwart Bracing" thread coming along soon. It will be interesting to see how the sail points alongside the lugsail. Perhaps if we get out on the water together in May, we can do a comparison. Technically, it should point slightly better. I just like the simplicity of reefing the Bermudan rigs over the Lugsail rigs and the fact that it can be done on the move. You must find that you need to adjust the leeboard angle as you reef down and up. For some reason, the shape of the Bermudan rig looks better with outriggers than the Lugsail rig. Can't put my finger on why, but to me it just does. Looking forward to hear how you get on with some paddle steering with it. My gut feeling is the tall mast and extra leaning of the canoe might make it more difficult somehow, unless it was reefed down a fair bit. I'll let you try the storm sail sometime for paddle sailing. I was really impressed with it last week. I felt much more comfortable with a smaller sail assisting me while paddling, rather than dominating me, but this may come down to the fact that I am not a strong paddler. A strong paddler could probably handle more sail than I could. Anyway great stuff. Looking forward to seeing one in the flesh. 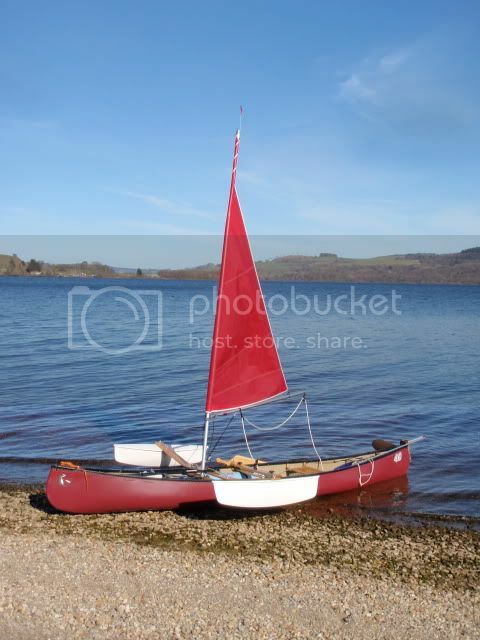 I already knew about the flex issue (it was there with the Lugsail as well but to a lesser degree) and had decided just to live with it as I was intending to have a dedicated sailing canoe as well. 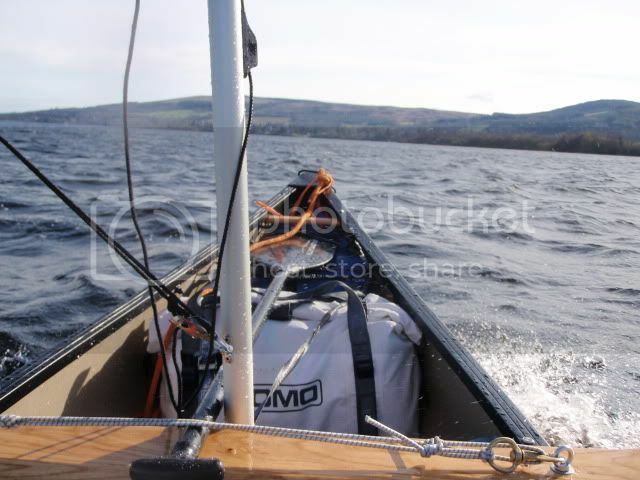 I think that with this rig in my particular canoe (and possibly others as well) some form of bracing will be necessary. I'm looking forward to hearing Dave S' thoughts on the subject and whether this may be something that might need further thought with the Bermudan Expedition Rig (i.e. whether he feels that the rig would be better supplied with a braced thwart of some kind) of course it may not be a problem with heavier canoes. It was something I was expecting though and wasn't a surprise and it just meant reefing early to control the amount the hull was deflecting. I suspect that it wouldn't be an issue while paddle steering as the forces generated would likely be less. The rig definitely points higher than the Lugsail, there's no question about that. I thought that the Lugsail did pretty well to windward anyway but this definitely points higher. I agree that it looks better with the outriggers (although I love the retro appearance of the Lugsail mounted on a traditional craft like a canoe without outriggers). I'm not sure whether the taller mast will be an issue while paddle steering. As it's so easy to reef down in small increments I don't see why it should be (unless you get sucked into a macho "trying to hold onto too much sail" attitude). On the topic of easy reefing, I can slab reef my Lugsail almost as quickly on the water as I can reef the Bermudan. The big difference is that you have so many more small reefs available as opposed to the all or nothing reef on the Lugsail. I didn't find I had to move the leeboard forward at all today (it'll probably be necessary when reefed down really small) although I did angle it backwards when going downwind but then I always did that with the Lugsail. The canoe tacked through the wind nicely with the leeboard pointing straight down. 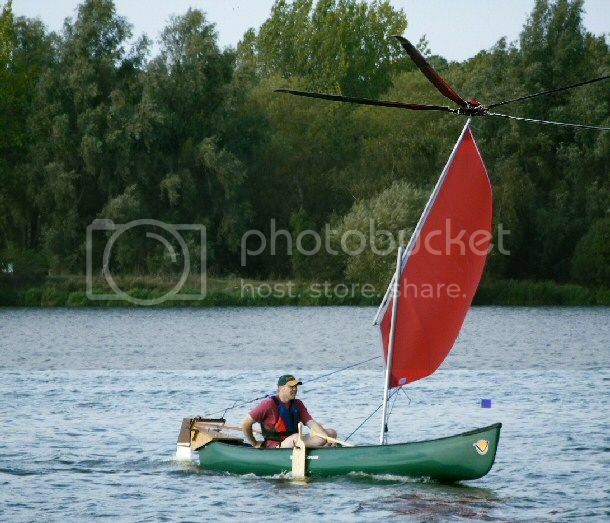 A good looking rig..That downwind action seems a cracking pace.Did you have a gps and measure the speed,Jurassic? The height of the mast is around 12 ft 6inches ? ( you could measure this for me to check what it actually turned out at) but the important height is the centre of effort of the sail. The lugsail has a shorter mast at 7ft 6inches but the yard on top of that probably puts the top of the sail nearer 10ft 6inches?. It would be interesting to lay one rig on the top of the other on the ground and then compare their centre of efforts. I would be surprised if there is much difference. We now supply, as standard, a braced thwart for the 44sq ft Bermudan as the larger area AND higher centre of effort combine to give a larger overturning force on the canoe. We would prefer to keep the Expedition rigs with a simple thwart, to keep the weight down, impact on the paddling canoe, and price to a minimum. I can easily upgrade your thwart to a braced thwart, as your canoe seems to be particularly flexible, but for most people , sailing without outriggers and reefing sooner it should not be necessary. I'll put both rigged sails next to each other and photograph them next time I get chance Dave and I'll measure the assembled mast on Sunday. As you say I don't think the overturning effect of the rig is that much different to the Lugsail it doesn't feel unstable and if you do reef you lose sail from the top of the mast further reducing the overturning effect. As regards the braced thwart, I tried to get across that my canoe is particularly "soft" in that respect and I agree it wouldn't be an issue while paddle steering or probably even sailing with a rudder but without outriggers. I was pushing it pretty hard at times to cause the mast step to deflect so much (because I was having so much fun). My over riding impression of the rig was how much higher it will point compared to the Lugsail (which is pretty good anyway). I've heard others talking about how a Bermudan is more efficient upwind than a Lugsail and to be honest I felt that they were maybe overstating the difference but I can see what they mean now. I was going downwind at a fair pace Andre but I don't have a GPS unfortunately so I don't know how fast it was. While fitting the boom I immediately noticed that there's a bit more headroom than with the Lugsail which is good news when tacking and would be handy if carrying a passenger. Chris, could it be that your mast thwart and mast foot are aligned to tilt your mast backwards slightly perhaps? Or perhaps mine is tiled forward slightly, looking at my photos below! It's just that I have bags of headroom under my boom. No mine is tilted back, it provides less drag and allows me to break the sound barrier more easily (or maybe it was misaligned slightly when I mounted it or perhaps the mastfoot "crept" slightly before it was screwed in). I hate that when it happens, creeping mastfoot. It just occured to me though that the new mast is in two parts and perhaps there is an element of flex at the joint that allows the mast to lean back more. The photo of the new rig certainly more swept back, though it could be an illusion as you did not take the photo square on. I don't suppose it really matters in any case just as long as it is square port & starboard. When I fitted my mastfoot, I did it on my garage floor and made the assumption that the canoe would sit in the water the same, but this isn't the case. My weight tends to push the aft end down and this lifts the bow. On a reach (Seen in the top photo) my mast sweeps back, but on a run (Seen in the bottom photo) my mast sweeps forward. 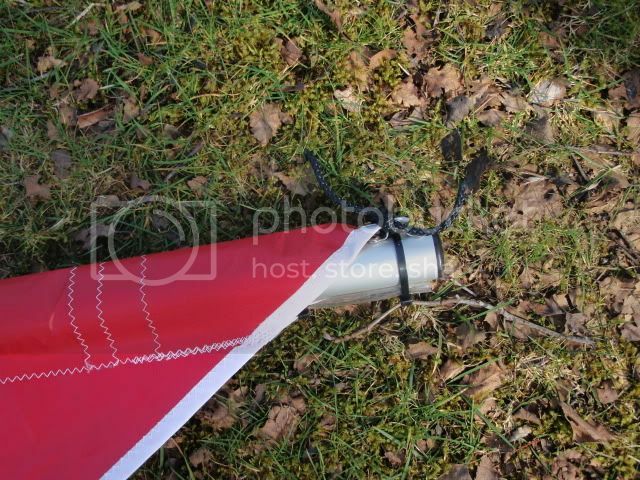 I thought I had the mastfoot bang on when I fitted it but Hawkeye Stubbs noticed that my mast was tilted back at the Last meet at Coniston in October. I can't say I'd ever noticed prior to that but now it annoys me everytime I look at it! It'd be easy enough to resolve by moving the thwart forward slightly but I'm not sure I'll ever get around to it. The mast on the Bermudan does seem to exaggerate the appearance though (probably just because the mast is longer). The mast does flex back in an arc when the sail is powered up and tensioning the kicker has the same effect. I'd leave it Chris. It makes the canoe look faster, more Bullet Train or Bugatti Veyron! As long as you get under the boom okay, the tourists will be taking photos of your canoe and no one elses! The mast leaning back a little may not be a bad thing. It will give the rig a little "lift" when running, helping you up onto the plane? It certainly looks better than a rig leaning forward. Oh Dave, leaning the rig back to create lift when running is so last century! its a grate looking new rig, realy imprest with the feed back your geting ! 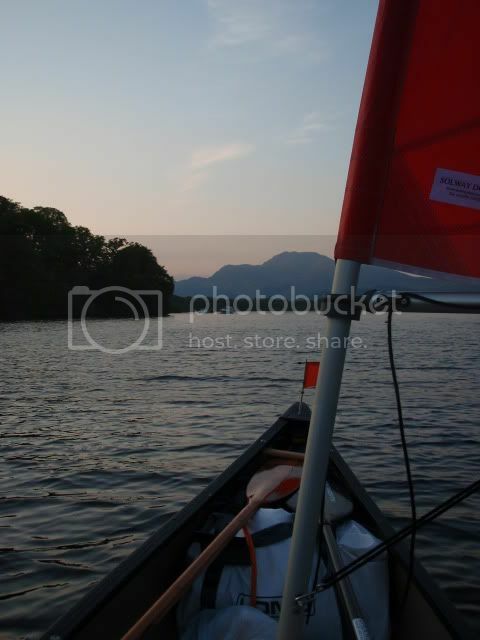 realy like that you kept with the radial rig , much beter option than stays , Im realy surprised that open Canoe sailing hasent taken on down hear . 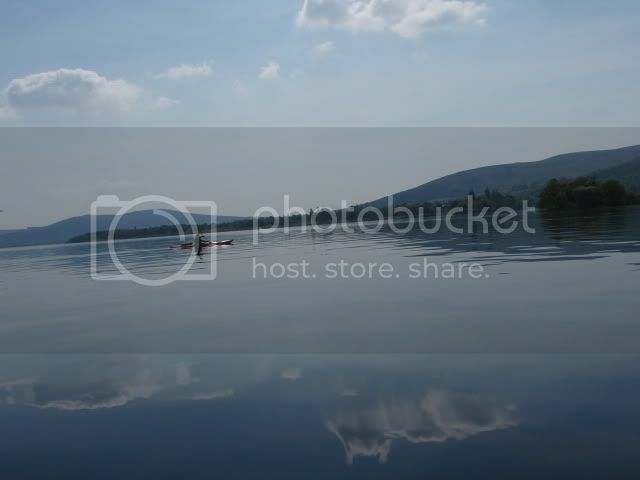 Thats a funny place to stow your two kayak paddles. Haven't you got room in your canoe? Thanks for the compliments, Mick. The reality is that we (Solway Dory) have been promoting open canoe sailing for over 20 years and it is still only a minority sport. SOTP is a great place to get the word out there though, and we are gradually getting more people wanting to try it out. Dave, Im hoping Flat Earth Sails is still around after 20 years ! 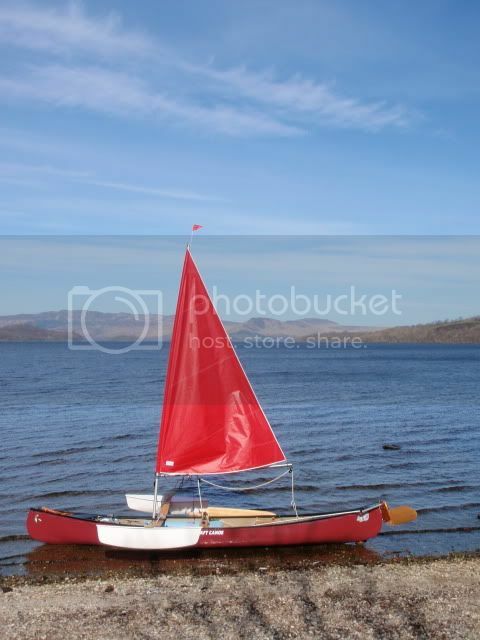 the more I read on this forum the more I think I wont to get back into open canoes , we are about to start bilding a new home and sail loft on the lake , a perfict place for a canoe, im looking at sumthing like a mad river canoe to replace an aging cocpited white water canoe thats destin to have stroberys grown in it . is the bermuden the 1st of a new model ? We have always done Bermudans, as they are the best all round sailing rig that we have tried (and we have tried lots of different rigs over the years.) The new one is the first where we have pandered to the paddler who wants the rig to take down to a small stow able package. That is why we have gone back to a sleeved sail that is quick to take apart and re-assemble. I really like them because they are quick and easy to reef. In the UK we often sail in very changeable conditions where a nice force 3 blows up to a force 5 or 6. I can reef the Bermudan in a few seconds, one handed, whilst i sail, keeping control of the canoe. And the great thing is that each turn of the mast takes off another small amount of sail so that you can set just the right amount for the conditions. Yep, I can vouch for that , during last years meet at Coniston my 44 foot Bermuda was, to start with, furled down to the smallest sail size possible and it was still able to make way upwind in what must of been a F5 at the least. Although adding a little bit more sail area afterwards I noticed the controllability and 'bite' the canoe had in the water was significantly improved. I measured the assembled mast today and it's 164"/13'8ish"/4m16.5cm so a bit taller than you thought Dave. I also laid the sails out next to each other to compare the difference in height between the two and it's less than you'd think. I lined up the bottom of the luff closely but now I look at the pics the clew isn't quite lined up but still it gives a good idea of the comparative heights of the two sails. I also did some comparative flex tests on my canoe trying both rigs and I can confirm that it's my canoe that's the cause of the problem not the extra height of the rig. The mast foot deflects (visually) just as much using the Lugsail as it does using the Bermudan. When I got home I did another thing that speaks volumes as well, I took the Lugsail out of my van and into storage. I'm not saying I'll never use it again but I can't see any reason to use it in preference to the Bermudan at the moment. The bottom line is that although the Lugsail works very well, I'm pretty sure that the Bermudan works better. Looking at your last photo Chris, what is stopping the back of the boom or Clew end from falling down onto your head? The sail is rolled right up or reefed fully, so looking at it, the weight of the boom is being kept up by a small piece of sail right near the mast. There isn't any kind of stay at the Clew end of the boom going up to the mast head to take the weight so if you pulled in your sheet in the close hauled position, the forces involved would be high on the sail material looking at it, but I could be wrong. If you look at pictures of any of the SD Bermudan rigs you'll notice that this is the default "parking position", I can't imagine ever sailing the canoe with the rig reefed so small. The next step if you were packing up would be to unhook the outhaul from the clew and furl the sail fully round the mast ready for removal but if you plan to go back out sailing again this is a handy short term measure that allows the sail to be unrolled again in seconds ready to sail. As you unwind the sail (even one turn) the boom drops down to a more normal position. Chris is right. You would not use the sail when it is reefed to that extent, but it is useful for "parking". When it is left like that the wind doesn't catch it so it can be left like that for a lunch stop. If i was going away and leaving it i would roll it right away and take the boom off. I then use a sail tie to stop the sail from unwinding. In really windy weather i would also lift out the mast and tie it down on the gunwales. This new rig looks brilliant, I have been thinking about getting an expedition rig for my paddling canoe for a while, but wasn't sure if the Lugsail would give the performance I was looking for. If I hadn't just been laid off I'd order one now, but when I find a new job it will be one of my first purchases. Thanks for an excellent review Jurassic. Hi Barney, I think you'd be surprised how much performance the Lugsail offers (I certainly was) but this new rig is perfect for someone such as yourself (or me a year ago) who wanted an Expedition Rig but had a niggling doubt about whether you'd miss the extra performance a Bermudan offers. As I said in the review this new rig allows you to have your cake and eat it. Dave, have you ever considerd yousing vertical baterns to improove the roach of your sails ? I made up sume ''big boat ''sails for a 38'er with in mast ferling and the design had vertical baterns at first We wher sceptical but thay worked realy well , and you wold stil be abel to role reef the sail . Im looking at a mad river today, in a light construction of thermoform wold it be strong enough to take a mast ? Oh I see, parking position, makes sense. I am guessing that rolled out to say 1-square meter in the strong wind reefed position there is enough support from larger amounts of sail to nicely support the boom. Is there any point SD still making the 35 sq/ft Expedition lugsail if the new Expedition Bermudan is cheaper and with apparently higher performance? Why would anyone want to pay more for less? Would the 25 sq/ft Expedition lugsail work out cheaper and would there still be a market for them? That's a very good point Dave. Not something I have experienced before as mine doesn't lean back, but I have had many a race in zero wind conditions waiting for those little ripples in the water as the gentle winds head over to me. Having the boom swinging around over my head would be a nightmare. 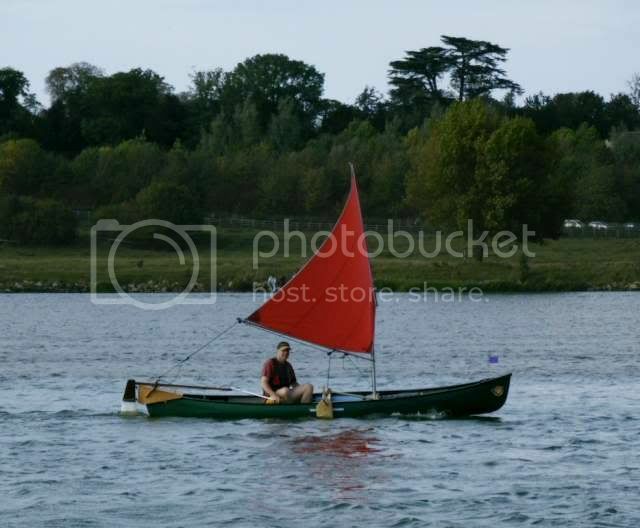 My Enterprise has rowlocks and oars, so I could stick the oars in, but it would undoubtable result in a complaint to the race officials! This is what I couldn't understand about canoe racing, you are allowed to use paddles. On light wind days it's more about paddling and a little Egret with a 25 sq/ft Expedition rig could easily out-perform a Shearwater with a 50-sq/ft Bermudan! You're not quite right there Chris. The sailing canoe races we have had in the past have not allowed the use of paddles to add speed to the boat, only to steer or tack the boat with rudder or reverse strokes. 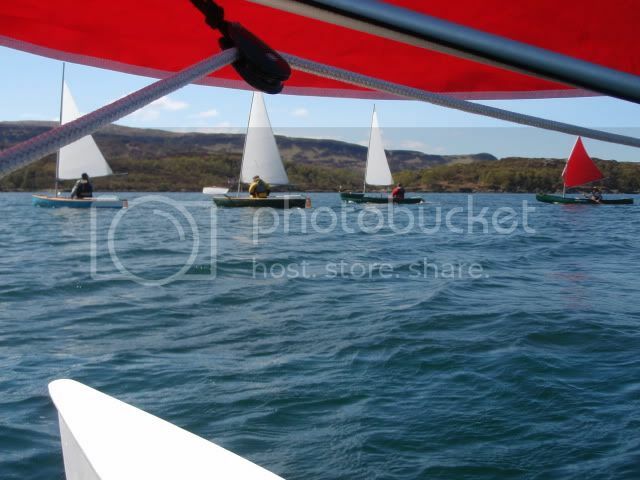 We have had sailing/paddling races where there are alternate legs using either sail or paddle for each. We'll talk about it at Rutland as it can get complicated. I've been thinking about buying the SD Expedition Rig 35 for a while, but now I wonder if I'd be better off with this new rig. How should I decide between the two - in simple bullets what are the different benefits of the two rigs? Dave , I can relate to the cost thing, and overpowering a small boat is easily done, my kayak rigs are kept small to help eliviat the stability thing, being bilt for expodition stile kayaking Im not big on sponsons and lee bords. but I can see thay are apropriat for open canoes , and from what I see thers a lot of RnD gone into the SD rigs , and I do love the simpalnes of good afishant design . From what I can tell the new Bermudan rig should sail closer to the wind by about 5-degrees and has the benefit of being able to reef quicker, easier and in many more increments, which is great. The canoe looks more modern to my mind also. The rig would appear to be taller though I wouldn't think there was much difference in the centre of pressure so the leaning amounts should be similar. Personally, I like the new rig, but there is something charming about the look of the lugsail, which attracted me to it in the first place. I have never needed to reef my lugsail because the winds have never been strong enough and I have a 11 sqr/ft storm sail if it ever got really windy, so unlike Chris, I won't be buying the new Expedition Bermudan rig, but I can see the attraction. 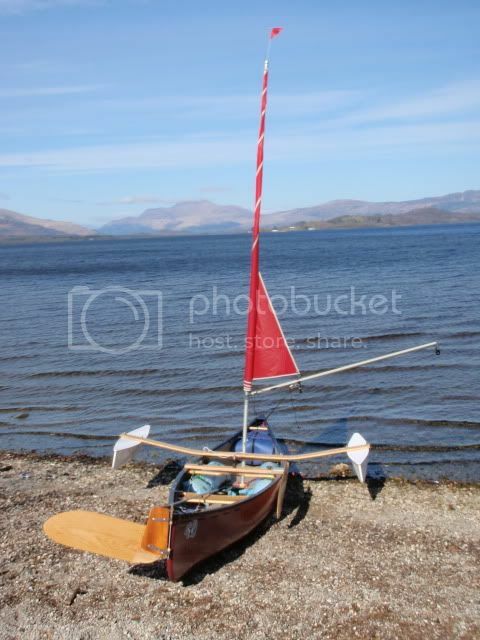 I'd like to hear how folk get on with paddle sailing this rig. My thoughts turn to the height of the mast especially if it is reefed and much of the mast is waving around doing nothing. It may be a benefit or a disadvantage. Greg is the master of paddle sailing on this forum and I noticed that he seems to prefer the smaller 25 sqr/ft Expedition rig over the larger 35 sqr/ft rig. Would he now prefer the new Bermudan, I look forward to his thoughts. I know that i may not be believed because i am trying to sell them, but to me there is no doubt that the Bermudan is a better all round rig. It will sail closer to the wind, it can be reefed much quicker and more easily, it has more reefing options (ie a bigger range), is a simpler rig. 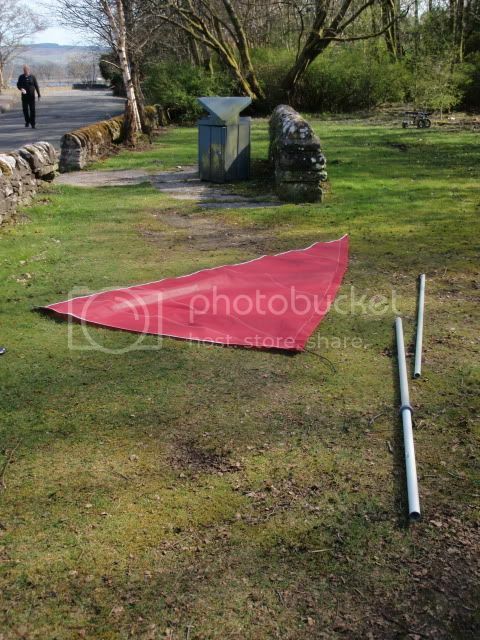 If the sail is kept rolled up on the mast when not in use it keeps the sail cloth crease free. The only down side is that it takes a little longer to take apart if you want to dismantle it to stow under the thwarts in the canoe. This was the main reason that we brought out the Expedition lugsail because we thought paddlers wanted this ability. But personally i have sailed with Bermudan rigs for years and know how good they are. It might be a good idea to phone Solway Dory and have a chat, they're very friendly and helpful. My own comments would be that you wouldn't be disappointed with either rig. The Lugsail may be very slightly more stable but I'd say that this fact is more than compensated for by the reefing benefits of the Bermudan. There's really no reason to ever be overpowered with it as it's so easy to reef and allows you to really fine tune the amount of sail available exactly to your requirements. I was the first person to have an Expedition Lugsail with reefing points (my existing Expedition 35' Lugsail rig was used as the prototype for the High Spec rig) and it's great to know that if things get a bit scary you have the bail out option of a reef. The problem with the reefing Lugsail is that it's a bit all or nothing in that when reefed it's pretty small. There have been times when it would have been nice to have something in between the full sail and the very small reefed sail and that's exactly what the Bermudan gives you. I agree with Steamerpoint that the Lugsail looks great and I have absolutely no regrets about buying mine, it's taken me on some great adventures and given me more enjoyment than I would have ever imagined possible but if I had to choose which rig to buy now it'd be the Bermudan for me. It has some significant advantages and is slightly cheaper into the bargain. To answer your bullets, I'd say Bermudan- more reefing options, easier to reef, sails more efficiently upwind (which is important), better for inexperienced sailors (as you can reef it to ensure you're NEVER overpowered). Lugsail- fantastic looking (if you like the traditional appearance), may have a slightly lower centre of effort (but this is a moot point since you can reef the Bermudan to ensure it doesn't get the better of you). Rigging times are very similar once you're used to the routine (sleeving the mast on the Bermudan takes no longer than setting the yard on the Lugsail). It's a tough choice though, I'll grant you cos they're both great rigs. 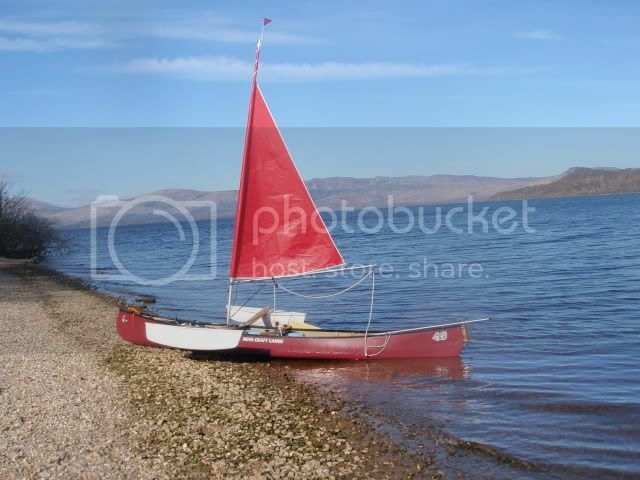 Having once had a balanced lugsail (homemade on polytarp) one good thing about it was the shorter mast which meant when I sailed it on the upper Thames I only had to lower the sail and not unstep the mast to pass under bridges etc. I prefer to keep the Bermudan sail on the assembled mast as it keeps the sail in good condition. It goes on the roof bars next to the canoe so length isnt a probem. It is then quicker to get ready than having to tie on the lugsail. That would be great but unfortunately I don't have that option as I have nowhere to store the assembled rig, I'm hoping that I'll still be able to keep the sail in decent condition though as it can be rolled neatly around the two separated mast halves without creasing or folding it. That's another great point unk, good thinking. There are a few bridges on the Caledonian Canal I need to get under next month and with any luck I can just drop the top spar for a few seconds and pull it up again while on the move. 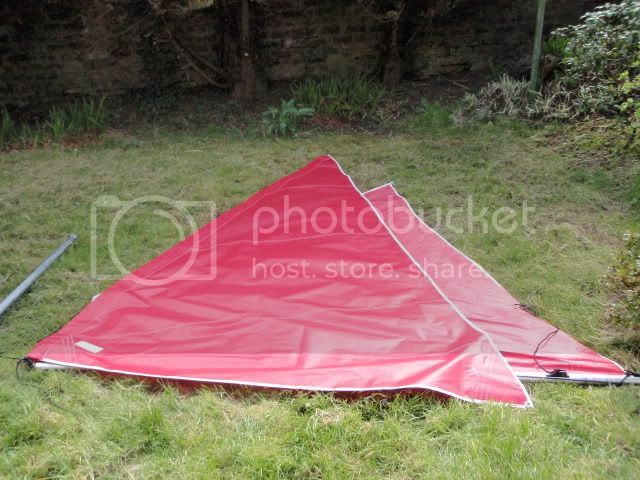 Chris, don't you fancy selling your lugsail to Lubaloo if you can't see you using it much in the future? I'm sure he can get a mast thwart and mast foot from Dave easily enough and your new sail looks better with outriggers anyway. Just an idea. That'd be like selling an old faithful, much loved dog just because you got a new young puppy. I just couldn't bring myself to do it I'm afraid, I love it too much and want to continue playing with it alongside the new rig (for the time being anyway). Using to rigs along side each other ! that I want to see. Surely Ketch Rigged, one behend each other would be better! ......................and want to continue playing with it alongside the new rig (for the time being anyway). Time for a quick update I think. I've used the Expedition Bermudan a bit more now and it continues to impress. I've now added a braced mast thwart to overcome the canoe flex issue which works very well reducing hull deflection to a minimum. Two weeks ago I was at Resipole on Loch Sunart for an OCSG meet and sailed in the company of an Expedition Lugsail 35, two Bermudan 44s and two Bermudan 5m rigs. 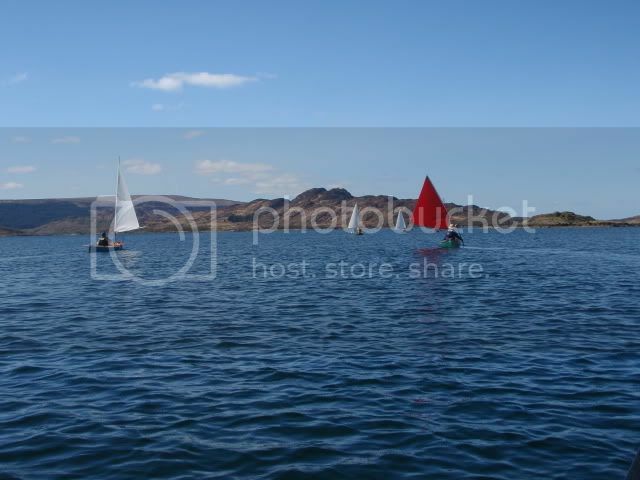 The sailing varied from good strong F4 to virtually no wind which necessitated paddling. The rig coped well with everything I threw at it and I managed to stay with the pack for the most part (although Tom with the Lugsail coped fine as well). The thing that continues to impress me most is being able to reef just the right amount for the conditions instead of having to either tough it out with too much or too little sail which sometimes happened with the Lugsail. Last edited by Jurassic; 12th-May-2012 at 09:40 PM. Just a quick update on a trip I've done on Loch Lomond over the last few days and in particular how the rig performed. I've been meaning to try it out in a situation that was more along the lines of what Solway Dory conceived the rig for and I had a good idea that the last few days would present that opportunity with light winds forecast for the most part and lots of paddling likely to be required. I decided to see if I could get all my gear in the canoe (including the outriggers, camping gear and food for up to four days) mainly just to see if it could be done and if so how much it would compromise paddling performance. I managed to get everything in and on the canoe without too many problems as you can see in the attached picture. The canoe paddled fine loaded up like this and while I knew that I was unlikely to need the outriggers it's interesting to know that I could take them on a paddling/sailing trip further afield and be ready for all eventualities. There was no wind at all when I set off on Tuesday but after paddling for what seemed like ages the lightest of breezes picked up and as I was desperate for a rest (not being paddling fit) I stopped on a narrow rocky beach and rigged the sail. As it was a following wind I didn't bother with the rudder or leeboard and just paddle sailed (and ruddered with the paddle when I was feeling lazy). The rig felt fine like this and didn't feel top heavy or unstable at all, no more tippy than the lugsail. I made it to a beach opposite Tarbet on the east shore of the loch and set up camp for the night. My original plan was to continue north up the loch on Wednesday but all the paddling made the site of my recent surgery a bit sore (I think it's actually done me good but at the time it was painful) and I knew there was no wind at all forecast for Thursday. I didn't want to have to paddle all the way back again so I decided to use the little wind forecast for Wednesday to get back near to my put in point instead. Here's the canoe on Wednesday morning set up to sail but with the outriggers still stored onboard. The wind varied from nothing to F2 in the morning so I did a combination of paddle sailing and pure sailing and varied between rudder steering and using the paddle with the rudder up. I set off wearing just normal clothes as it was so warm and as the day wore on and the wind started to freshen in the afternoon I felt I should either be wearing some more protective clothing (I had my dry trousers and cag with me but chose not to wear them) or put my outriggers on but I couldn't be bothered stopping to do either! By late afternoon it was a lovely steady F3/F4 and I was loving sailing without the outriggers (despite the fact I knew I couldn't afford a capsize). My friend Sean decided to come out to meet me in his kayak and stay out overnight so when I went to meet him on Wednesday night I finally relented and put the outriggers on (as it was going dark and the wind was still building and I was still wearing normal clothes). The rig's really brilliant, I feel like I've tried it as a proper paddling rig now. I'm not exaggerating when I say how good it is now that I've tried it out in true paddle sailing conditions as well as just using it with the rudder, outriggers etc fitted as I've done previously. Much as I love my Lugsail, I'd have no hesitation in recommending the Expedition Bermudan to anyone looking for an expedition type rig, it can do everything the Lugsail can and more and costs less than the high spec Lugsail into the bargain! I think the only improvement I can make to my canoe for this type of sailing/tripping is to have one of the Solway Dory Expedition Leeboards fitted on the left side of my canoe (I currently have a full pivoting leeboard fitted in the conventional manner on the right) so that I can get a better, more efficient paddle stroke in on my strong side. This further modification is in my plans for the future. I have some nice video footage as well but I'll wait until I can get some clips Sean took as well to include them, I should be able to post it next week sometime. Last edited by Jurassic; 25th-May-2012 at 12:07 PM. Nice account, Chris. It is a shame that you felt that the outriggers were necessary to take along with you but i totally understand the fact that you were on your own, the water is very cold and the air temperature was too hot for the drysuit. Hopefully this good spell of weather will warm up the water soon. 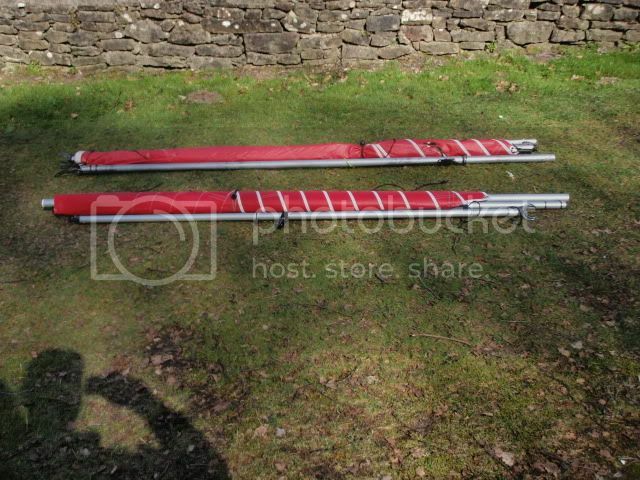 I think you misunderstand my reasoning for taking the outriggers Dave I was 95% certain I wouldn't use them, I just wanted to see how practical it was to carry them on a trip where I might be doing a variety of paddling/paddle sailing and pure sailing. It was an experiment for future reference to see if it's viable to take everything on a longer trip when I may not be sure what the weather or conditions were going to throw at me. 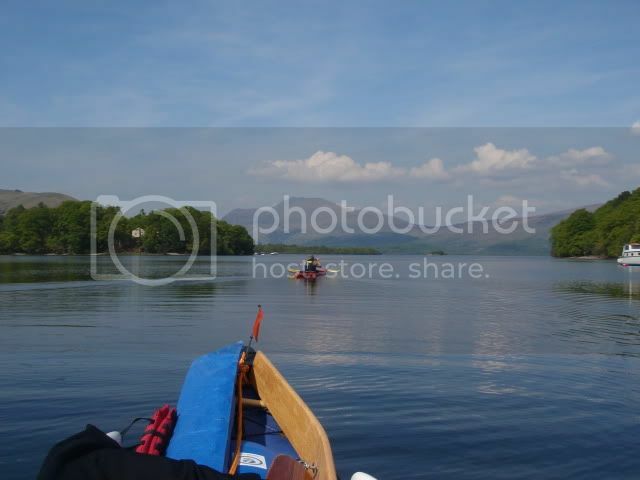 My conclusion is that it's eminently doable, the outriggers and spar (while not ultra light) don't really affect the way the canoe paddles so I would be happy do it again on something like the Loch Shiel circuit. On a trip like that it would mean that I'd be able to sail confidently even if the wind blew up and enjoy the conditions as opposed to having to reef right down or even drop the rig altogether, I also now know that I'd still be able to paddle efficiently if there was no wind (albeit I need to work on my paddle fitness). I do feel a little guilty about sailing on my own, without outriggers and with just normal clothes on as I know the water is still very cold. A capsize would have been serious in those circumstances and it was really just laziness on my part that I couldn't be bothered to land and get changed into my dry pants and Reed shirt (which would have given me the protection I'd have needed in a capsize). I'll give myself the benefit of the doubt though and say it was a calculated risk and not foolhardy! What about deploying them whilst on the water? Could that ever work? Possible but potentially very tricky I'd say - but if you've decided to take outriggers on a trip, I can't see an advantage in carrying them in the boat 'undeployed' unless the trip involved a lot of portages or the outriggers, or beam, interfered with paddling. Likely I'm missing a trick. Chris, why did you carry the outriggers in the boat? I don't think I could deploy them without landing Unk. Gavin, it just makes paddling a lot easier. The leeboard fittings force me to to paddle wide with a kind of sweep stroke which is really inefficient when I'm also providing steering and correction with the paddle stroke (no rudder or rudder raised) and the sweep also often sees me bumping the outrigger with my paddle which is annoying. 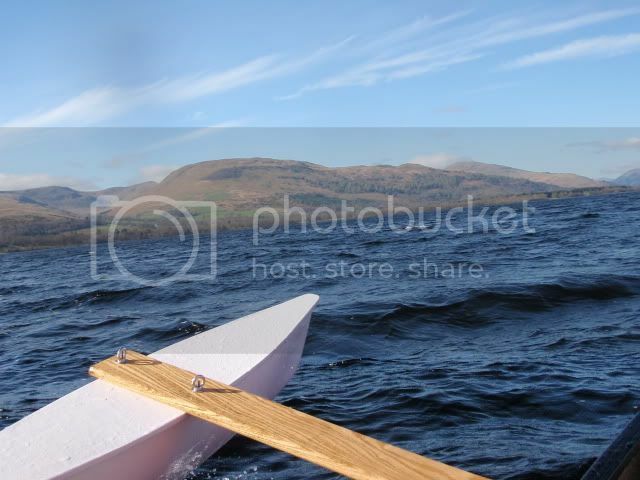 If I have the rudder down and tiller locked off the sweep is less of an issue but I like to combine steering and propulsion into the paddle stroke, it just feels more enjoyable and satisfying to me in my canoe. I also like to heel the canoe while paddling (this allows a more vertical paddle stroke which decreases the amount of correction required so increasing efficiency while using a J stroke or similar) and the outriggers interfere with this and are constantly in the water (possibly increasing drag) when I do. When I get the Shearwater I'll probably always paddle that with the rudder down and tiller locked off so it'll be completely different with that (indeed I'm currently writing some questions for Greg relating to this topic and paddle selection for FB). That makes sense Chris. My experience of single blade paddling and paddle sailing (with a single blade) is very limited. 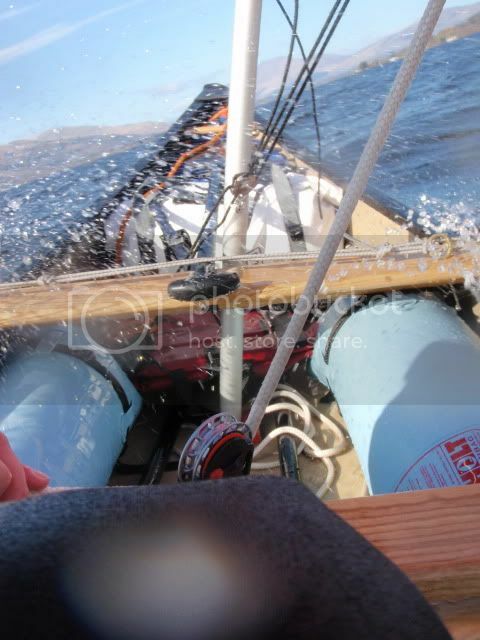 However, I have recently enjoyed combining propulsion and steering into the paddle stroke (with the rudder raised). In doing so (in a slightly larger boat?) I was possibly able to sit further back in the canoe thus avoiding clouting the outrigger beam. Also, Solway Dory have provided me with a more 'upswept' beam - allowing more main hull heel before the outrigger float hits the water. Took delivery of an Eden Wood chestnut pattern paddle today, with a very long 40" shaft. I'm hoping this will mean I can paddle well from a high seated position whilst also sailing. Early days, and I'll be in a much better position to say how this all fits together, or not, in a few weeks' time. Last edited by GavinM; 25th-May-2012 at 08:12 PM. I have recently enjoyed combining propulsion and steering into the paddle stroke (with the rudder raised). In doing so (in a slightly larger boat?) I was possibly able to sit further back in the canoe thus avoiding clouting the outrigger beam. I think that the mast and leeboard mount are further forward relative to the paddling position on the Shearwater. 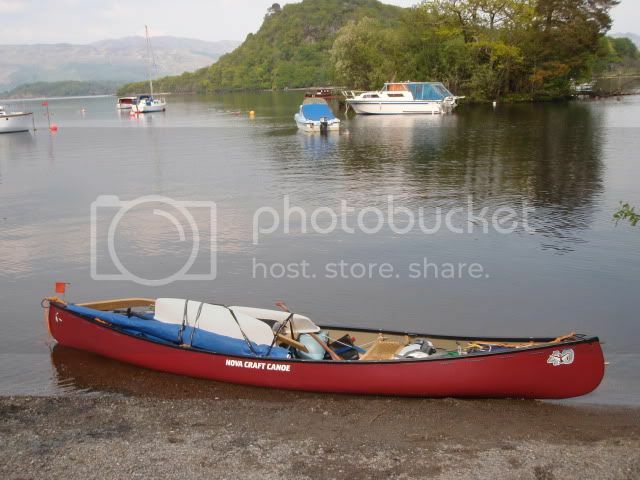 My leeboard thwart is attached to the carrying yoke (dead centre) on my canoe and my paddling position is right behind that) although my canoe is 16' so roughly the same length as the Shearwater. Interesting to ponder paddle choices, the Edenwoods are lovely but I've been wondering whether to buy a bent shaft paddle to use with my Shearwater (on the basis that I'll just leave the rudder down on it and not use a correction stroke). I'll await your findings on the long paddle with interest (I suppose it'd be sensible to try paddling my new boat with my existing paddles in the first instance and see how I get on with them). Last edited by Jurassic; 25th-May-2012 at 08:30 PM. My current thinking is that I'll use a single blade for paddle sailing and a double blade for paddling in no wind. When I paddle sail, I'm hoping I'll mostly be able to do this with the rudder raised - using leeboard position, sail position, trim and paddle strokes to steer. Can't say about bent shaft paddles. 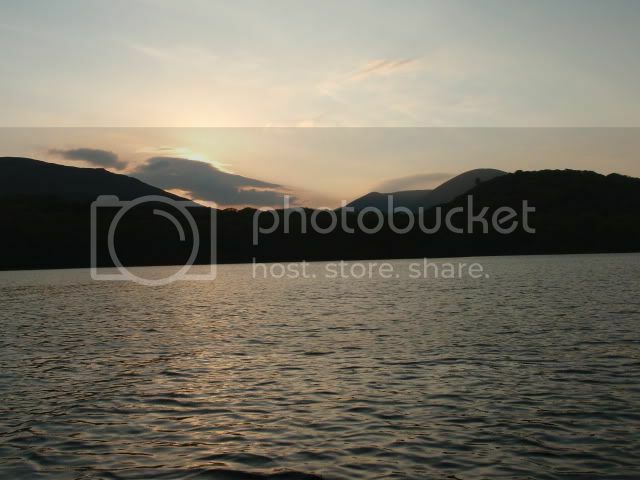 Last edited by GavinM; 25th-May-2012 at 08:33 PM. No, I have no experience of them either but if I've done my research right they're designed to be used for seated sit and switch (hit and switch?) paddling where the paddle strokes alternate between both sides of the canoe. I don't envisage doing that but I thought that if the rudder were down no correction would be required in the paddle stroke. The bent shaft also allows your hands to be forward at the start of the stroke while the blade is relatively further back which I thought might put the blade further out the way of the leeboard and outriggers. Hopefully Greg will shed some light on this and whether my reasoning makes any sense or not. The key point is that when you're seated, your rotation is compromised... so you can't easily get the nice forward "catch" that you can manage from kneeling... and the bent shaft shifts the catch and power phase further aft - into a zone that's generally found to be bio-mechanically sound for covering significant ground at a respectable pace. Thanks for that link Greg, that's a great discussion. I don't think I've ever come across a more knowledgeable, better informed bunch than those people!